Time flies. I am not sure if it is something which you notice only when you get older as I remember the summer holidays lasting forever as a child. 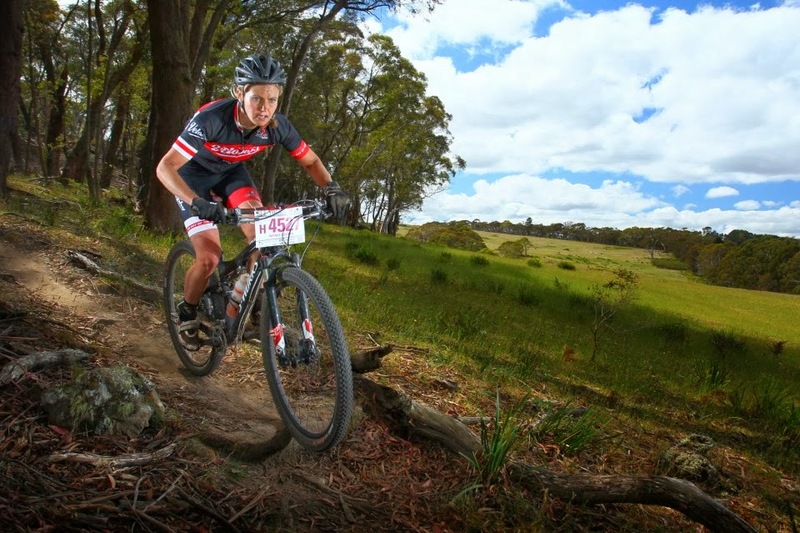 We are now 12 months on from when I wrote an article for Marathon MTB http://www.marathonmtb.com/2013/03/28/taking-the-next-step-going-pro/ about following my heart and chase the dream to race at elite level. Its hard to believe how much has happened since then and how many things have changed for me. Literally my life has turned upside down. I have moved countries, well hemispheres actually, changed jobs, changed coaches, made new friends, reunited with old friends, kept current friends, learned new skills, improved on old ones. 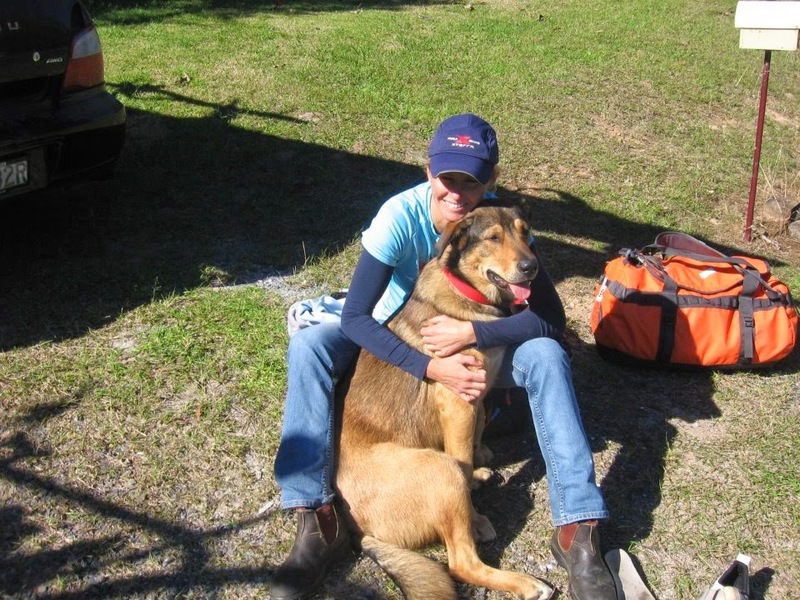 The only thing which remained unchanged was the loyal company of my dog Fynn who I had brought with me from Australia. And that small amount of familiarity, having a trusted dog by your side is what can make all the difference on a tough day. I have done this many times before, strangely it was probably one of the biggest but smoothest transfers I have experienced so far. It has made me wonder if I have become so anonymous that I can fit in anywhere these days, or have I finally found the right environment to do what I aspire to do. 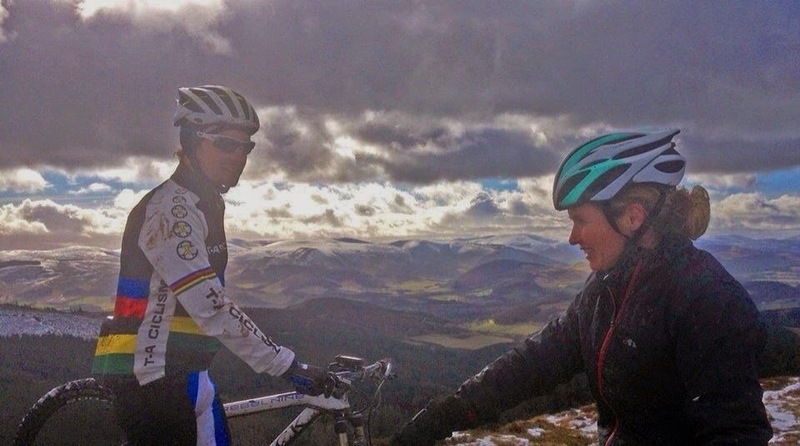 I must say training in the extreme Scottish conditions sometimes make me doubt that last statement!! Through the Xterra network of people I had become friendly with Kayak Olympian gone adventure racer, Scott engineer Alex Dimitriou, and when he invited me to come to Switzerland and race a multisport event just around the corner from where he lived in France, I was more than keen to use this race to get some speed in my legs for my upcoming season. As per normal anything to do with Alex feels like a Tsunami, 90 miles an hour, getting a thousand things done at once, from French to English to Swiss, multi tasking? Alex is proof that men can actually do it.I flew in on Friday night and the race was Saturday afternoon. Enough time to get everything sorted and for me to have a feel of the kayak as I had never done a race down river with rapids. Nor had I ever paddled in the type of boat they had organised for me. As per normal pre race things never go according to plan. Instead of practicing on the water, Alex was working on my bike to try and make it work before the race whilst my race nerves were starting to take over. The weather was very Scottish, did I really get on a plane? cold, windy and wet. It was a probably a good thing I didn't end up practicing in the boat as I would have been frozen before the race even started. We only just managed to get all our stuff in the transition zones ready for the race in time. The river was high after a lot of rain and the rapids in full flow. "they are only little" says the Olympian Slalom Kayaker, hmm yeah right! My race nerves got worse when Alex started to point out some of the girls at the event as Cross Country ski Olympians, World cup competitors and trail run champions. I started to feel a sick. Nico had given me a few tips how to deal with this and to my surprise I found myself more relaxed and positive at the start of the race then I have been for a long time. 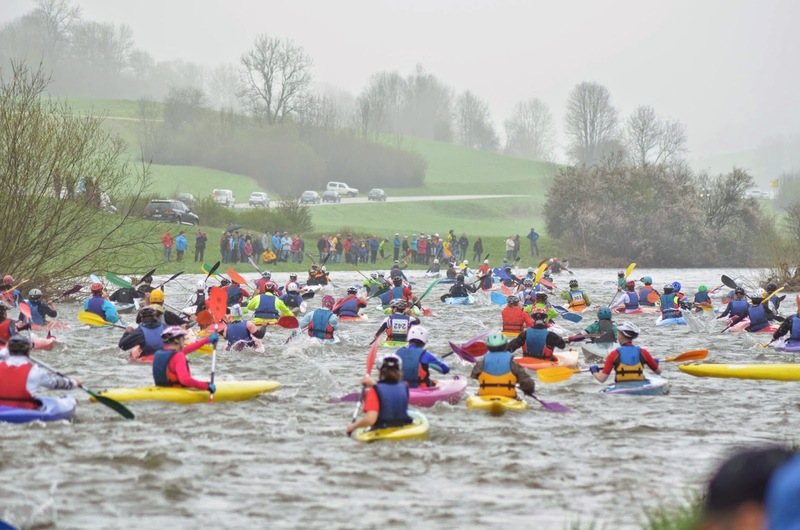 We started with a 200m sprint to the river bank and in these early stages of the race I was already lost trying to find the right boat, I recognised my number, jumped in, and off I went. Very different kayak from anything I had paddled in the past and before I even had the chance to start moving I was stuck backwards in the river bank, spectators were laughing at me giggling and with supportive cheers they helped me on my way. 'Race over' I thought whilst trying to steer this heavy peace of floating plastic. I was heading towards the first rapid and by complete luck I ended up in the line Alex had told me to take, whilst people were capsizing and going for a swim next to me I smoothly paddled through like a real pro, I was pretty chuffed with myself until one of the volunteers yelled at me that I was holding the paddle upside down. Embarrassing moment! I was hoping that with holding the paddle the proper way I was able to steer the boat easier but that was wishful thinking! I am not sure how I ended up making the 90 degree turn around the final boy heading for land! I was aiming for one of the volunteers waving at me but ended up at about 3 volunteers down from him! but on land I was!! Time to start racing. I had no idea how far back I was, with the longer run compared to the Kayak and Mountain bike I knew it was a runners race and would need a solid pace to get myself in a good position for the MTB leg. I wasn't really worried about where I was placed, I thought I was too far back to make any impact on the pointy end of the field. Although my legs were cold from the kayak leg, I felt pretty relaxed. The first kms of the run was flat and I was running at a pace where I was wondering how long I could hold it for at any point in time. But I kept pushing and my body kept giving. Great feeling. Coming from the back passing so many people along the way was a huge confident boost! When other people were having troubles running up a steep slippery climbs, I cruised up, winter training in Scotland payed off !!! Roughly 1kms from the run bike transition I eased up a little to recover for the bike. We were on the down hill now and I made sure the distance between me and the two girls in front of me didn't get any bigger but I stopped pushing. On the bike now and it was back to full noise, slippery, wet, sticky, windy, freezing cold and almost all climbing with some short, fast non technical downhills. A power course. I was still moving forward in the field and I felt like I had plenty more to give even though lactic acid was settling down in my legs properly by now. I could hear the finish line and people were cheering loudly. Race done. Alex had a very good race for 2nd male just behind his mate Ivan who's girlfriend an elite runner won the female's event. I was lucky that the kayak leg was short enough for me to run myself back to the front and finish strong in 2nd place, with a 2nd fastest run split and the fastest MTB split. Things were on track and I was happy. I was surprised how friendly the other girls were coming up to me to congratulate me and sussing out where I had come from. A good way to practice my French!! The day ended with a great catch up with fellow Xterra athlete Ian Pyott and his girlfriend who made us amazing pizza followed by icecream, with warm chocolate sauce and chocolate muffins. Great athlete, great cook!! Sunday was spent "recovering" riding up the Swiss trails near Alex's place. The climbs were completely worth the screaming legs, the views were endless and the single trail on the downhill alone was worth the whole trip to Switzerland!! Buzzing. 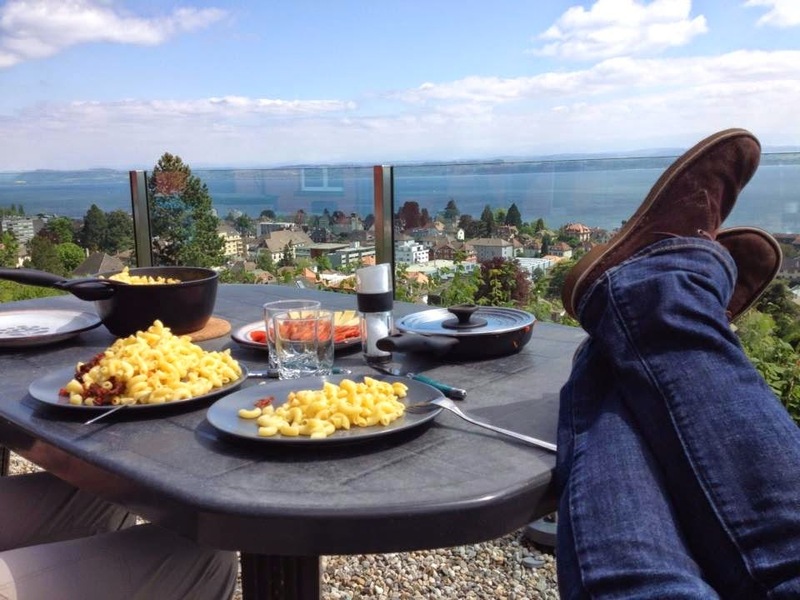 After the ride we had probably the only relaxing moment in 72hrs, engorging on pasta whilst enjoying a wonderful view on Neufchatel lake with the Alps becoming visible in the far distance. Magic. The start of my cross triathlon season, great race, great friends, great locations. Although I have never been a big fan of super positive people because I always wonder "surely life can't be that great all the time" I must say for me, after a turbulent 2013, 2014 has given me a lot of faith. Life is good.